Tobold was was taken aback by Syp's plans to play at least nine MMOs this year. Tobold observes that "in one game 20 hours per week results in some sort of progress. Split over many games, nothing much is happening". I wouldn't agree. 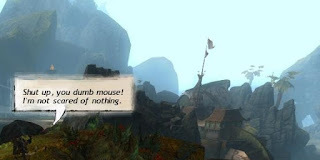 Not only is it, arguably, an outdated view of how MMOs work these days, when so much content and so many systems are overtly designed to meet the needs of players who log in only for short sessions of thirty minutes to an hour at a time, but it's predicated on a belief that MMOs have to be played according to some sort of agreed scale of progression. That's something I would argue does not exist and never has existed outside of the self-imposed limitations of individual players. To use an anecdotal example, I've mentioned before that we have a friend in our GW2 guild who has been playing since not all that long after launch. He only plays on Sundays, rarely for more than a couple of hours, and by no means every Sunday at that. He has just the one character, who hit level 70 only a couple of weeks ago. By the time Heart of Thorns is here he'll most likely have a single level 80 so you could say he's paced it exactly right. People play at the pace they prefer. I have plenty of characters I'm still working on in many different MMOs and some go back months, some years, some more than a decade. Every so often I'll log one in and chip away a little at the mountain. I'm making progress on all of them. It's slow, it may never be complete, but something is definitely happening. All the same I would never claim it isn't a challenge to keep all these plates spinning. And mostly they don't. A lot of them wobble and fall and lie there, forgotten. 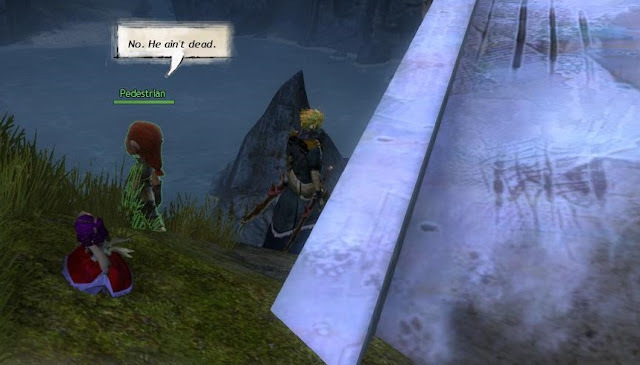 Stargrace has been pondering why we often just stop playing one MMO while we'll carry on with another. 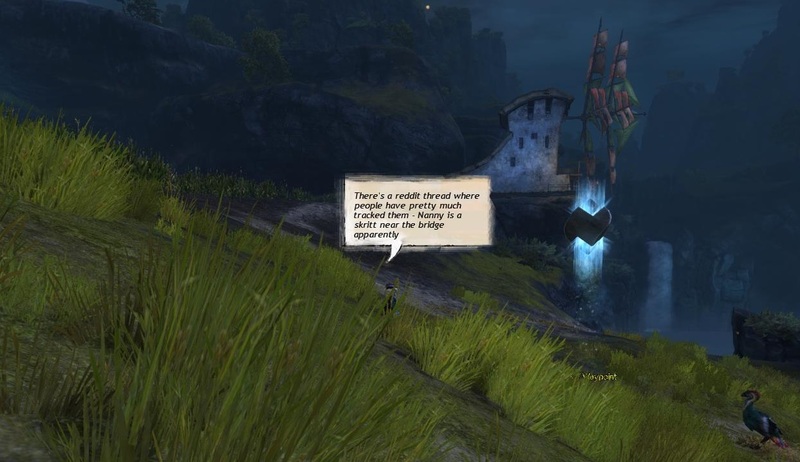 She comes up with several reasons that ring very true with me but the most common explanation of all is simply that there are too many good MMOs out there to have any hope of playing even a fraction of them regularly. So I guess Tobold isn't so far off the mark after all. 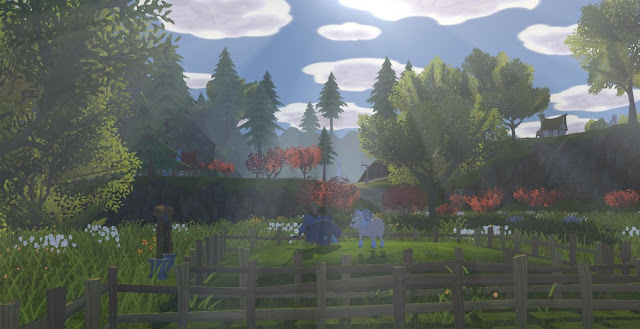 Sure, we can do a lot better than just playing one or two MMORPGs concurrently but in the end, however many we manage, it will only be a scratch on the surface of the genre. For a good while I wasn't happy with the variety in my MMO diet but things have improved of late. This week saw a small rollback in that improvement, thanks to GW2's giant patch, which didn't leave much time for other MMOs, but that should settle down soon enough. I hope so, anyway, because when you concentrate exclusively on one MMO you do inevitably miss out. 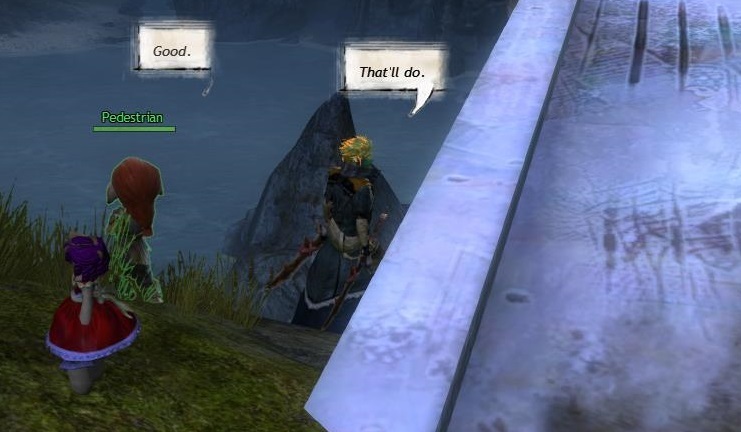 Because I couldn't, or wouldn't, stop playing GW2 at every available opportunity, I failed to get my Necromancer to level 10 so he wasn't able to vote in Daybreak Games' "should we break our own rules at the first sign of difficulty?" poll on Ragefire. Neither have I done my weeklies in EQ2, let alone put any more levels on my channeler. Dragon Nest has gone unplayed since I came back from holiday. I would like to get all those back into some kind of loose, weekly schedule, at least. Then there's the upcoming Anniversary in The Secret World, which is a great bun fight for tokens to spend on gear that I'd prefer not to miss. I'd also dearly like to finish the main story in City of Steam before I wake up one day to read they've shut the servers down. And on it goes. These crazy steampunk glasses turned up early on as a gift of some sort. I love them! 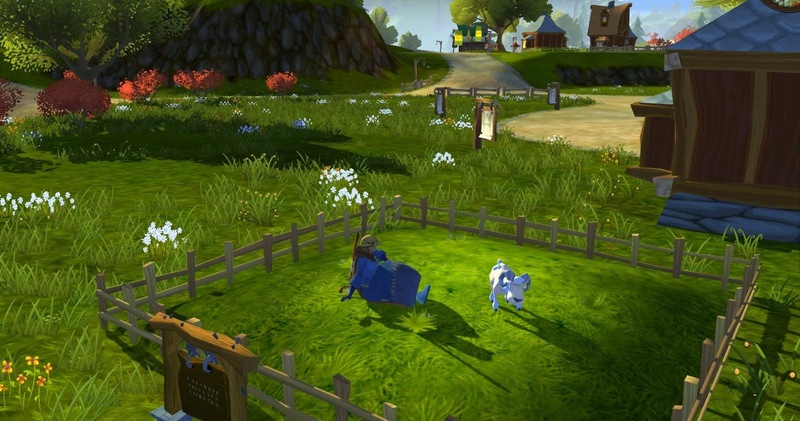 If there's one MMO I really want make more time for right now, though, it's Villagers and Heroes. I was having a great time playing before the Lion's Arch patch dropped and I felt I was making solid progress too. The bug that was roadblocking the main quest turned out not to be a bug at all. I went to the forums and, following the advice I found there, I was able to resolve the problem without taking up the very generous offer from V&H developer Cameron England, which he made in the comments to my last V&H post here, to look into it for me. That's certainly going above and beyond the call of duty! With that out of the way I somehow ended up down on the Lower Ethos docks again. 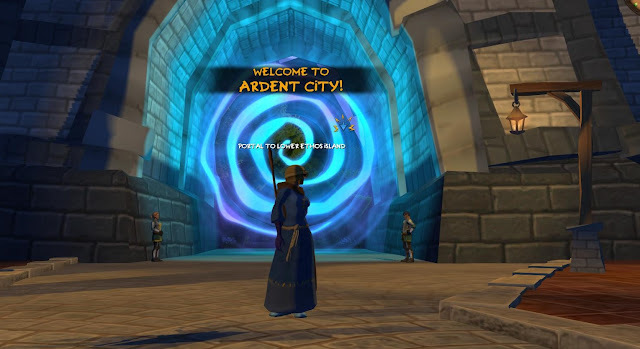 On a whim I decided to go through the portal on the ship that was moored there just to see where it went, which was how I ended up owning my own house. And a sheep. That was a surprise. I'm not sure why but I'd somehow gotten the idea that you had to buy your house from the cash shop. Not so. You get the basic one free for the asking once you visit Donald's sister Dareen. Donald, who appears to be a bit of a literalist as well as a shill for his sister's real estate business, suggested I limit my search to a village that had housing space available. 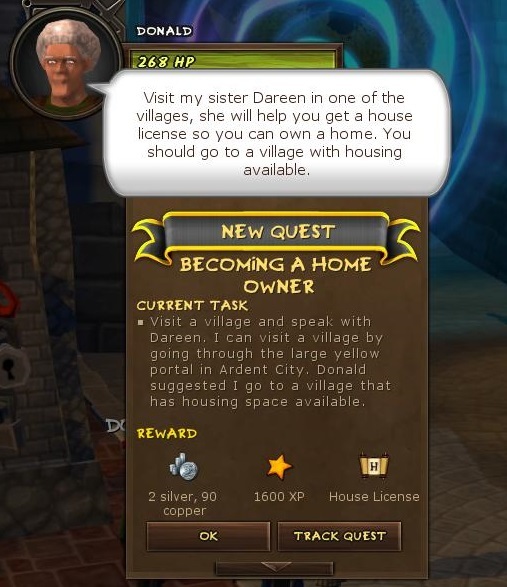 Following that impeccable logic (not that I actually saw any villages with the "No Vacancies" signs up but thanks anyway, Donald) I went to the portal and scrolled through a very long list of choices until the name of one caught my fancy: Autumn Woods Village. It was night when I arrived there. Night in V&H is an odd duck. Sometimes it gets really quite dark. Other times things just seem to go a bit fuzzy around the edges. Occasionally both happen at once. Seen by moonlight Autumn Woods looked delightful. I wandered around looking for a good plot. There was plenty of choice. In the end I chose a charming spot overlooking the lake. Seriously, who goes house-hunting at midnight? Witches? The villages, which are instanced, remind me a little of LotRO's housing but with much more visual appeal. 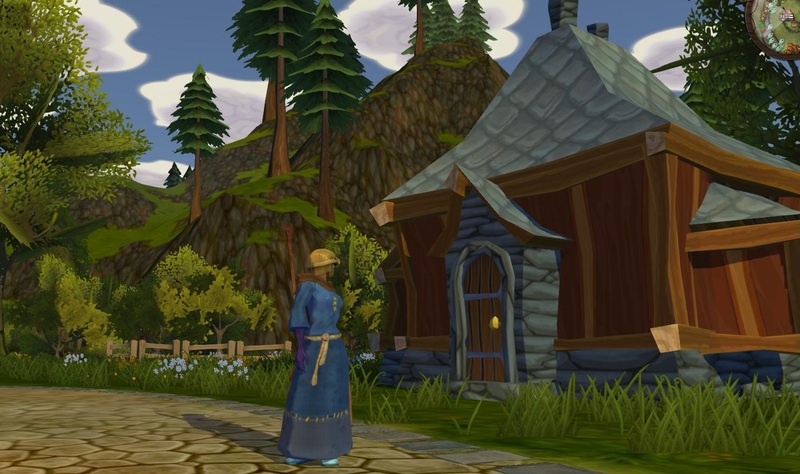 There seems to be a wealth of facilities for crafting and gathering within the village itself. 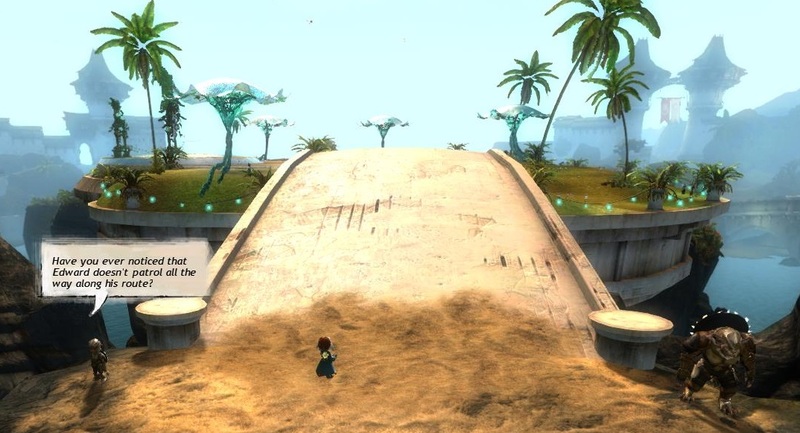 I'm guessing the bulk of the "Villager" gameplay takes place there. A large noticeboard lists a raft of communal activities with which villagers can join in and which, if completed, add to the available amenities. That reminded me of Horizons, which is really going back some, although I believe I've seen similar mechanics elsewhere too. Building my house was a simple click of the mouse. No messing around acquiring building materials here. There's a fairly large range of styles on offer but for my starter home I had the choice of just two. One seems to be the basic model while the other, I think, has something to do with a choice I made at character creation. It's got a door but don't get your hopes up. I was happy enough with my little cottage although I was momentarily puzzled to discover I couldn't go inside. It turns out that "housing" in V&H equates to storage not accommodation. It's not what I'd call housing but on the other hand it's by far the fanciest personal bank I've ever had in an MMO and it comes with a garden, so who's complaining?. When my "house" popped into existence so did a sheep pen and a vegetable garden. They're round the back. What's more the pen comes with a sheep already installed. Just the one. On my stroll around earlier I'd noticed some battery farms reminiscent of ArcheAge, where players had jammed a dozen assorted farmyard animals into a space barely fit for a couple of rabbits. Efficiency over empathy is par for the course in MMO animal husbandry it seems. Ok, sheep. If you had to choose between, oh, I don't know, a Blue drinking bowl shaped like a racing car or a Pink drinking bowl shaped like, erm....a princess, which one would you go for? I played with my sheep for a while and he (she?) asked me for a green apple. Talking sheep. Well, they talk in pictograms but its pretty clear what they're trying to say. It reminded me of ArcheAge again but even more so the much-missed pet training job in Free Realms. ...oh dash it all, now I really need to go check he (she?) isn't lying there, gasping his (her?) last or floating feet up in the lake. I'm not sure I'm cut out for this degree of responsibility. 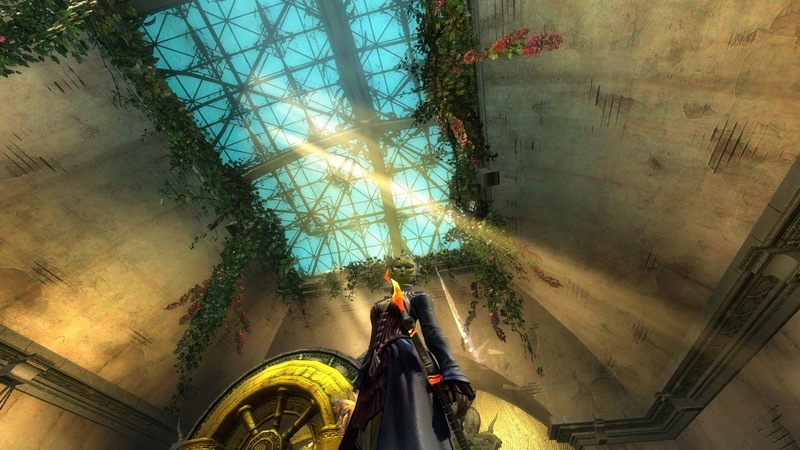 Lion's Arch continues to fascinate. There's a tour you can take but with amazing timing I joined the group just as the guide went on her break. She sent us all through the portal to Gendarran Fields and said she'd meet us on the other side. Then she stalked off in the opposite direction. We all waited by the bridge for a few minutes. Then I took matters into my own hands. I decided to make up a tour of my own. Well, not entirely my own. While I was exploring I also filled out the formal Map Completion requirements. Map completion was always exploring by numbers but with the addition of the onscreen pointers now it's more like one of those "nature trails" beloved of infant school teachers the world over. If I was any kind of efficient I'd have taken the trouble to pick up a rifle from Turl Sharptooth and potted a few Karka along the way. Mrs Bhagpuss has already bagged Princess for both of her accounts and I haven't even started. Must get on that before I drown in dragonite. Reason I didn't bother with the rifle this time is that it'll be no trouble to go round again. Any reason to spend more time in this rich and strange city is welcome. There's so much to see and hear, so much to do, so many secrets to discover. Oh yes, secrets. 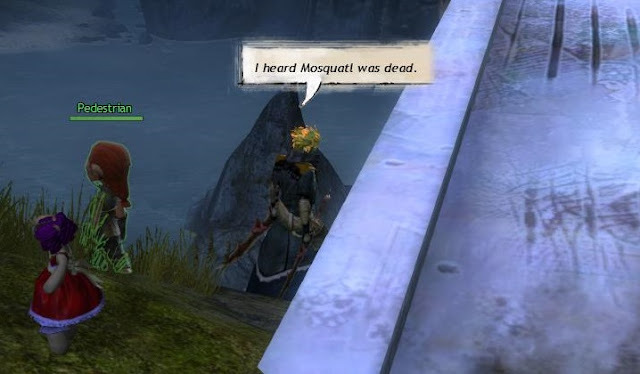 Lion's Arch is full of them. Sya has one. To be honest, it's not much of a secret, not any more. There's a twelve-page thread about it on the forums for one thing. If you happen on her, where she stands near Fort Mariner, she'll gladly tell you about it, if you ask. Her secret. Sya used to have another name. She's changed. And more than just her name. She's not someone I know well, more an acquaintance, really. We met at the refugee camp a while back. He was Symon back then. 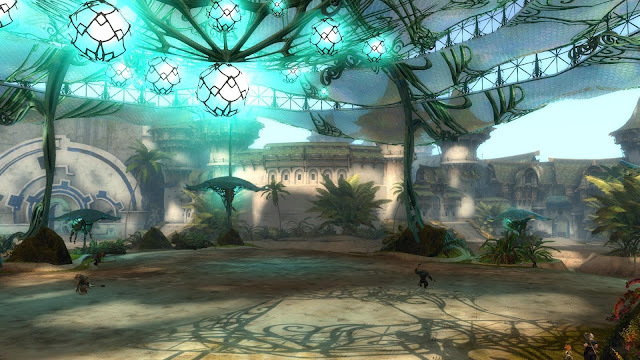 Tyria is becoming a new kind of world. Maybe having a clear and undeniable enemy helps us to focus on what's important. (The elder dragons. Remember? Big, lizardy, lots of teeth...) Makes it easier to understand what matters and what really doesn't. To make choices. Perhaps that's it. 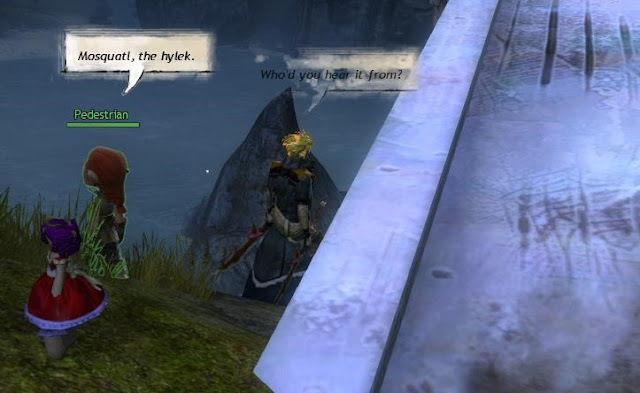 Old Tyria was big on lines you wouldn't want to cross. Charrs and humans, that was one. Remember the big deal when Rytlock and Logan even got as far as not trying to kill each other on sight? That was progress, then. Now we have Jordyn and Leyah and their Asura Guardian, blurring all the lines. Of course, those two always had vision. Let me remind you what Leyah told me when we bumped into each other a while back. She said "I'm teaching Jordyn how to be a soldier. She's going to be in my warband, and we're gonna be Ash legion, 'cause we're spooky". I said I didn't think humans could be in a Legion but she already had that all worked out. She told me "They couldn't be before, but me and Jordyn are gonna change that when we're tribunes. Probably in a couple of years or so." The way things are going will it even take that long? Look at Snikk and Scratch. Best friends forever, when they should be natural enemies, or at least experimenter and experiment. 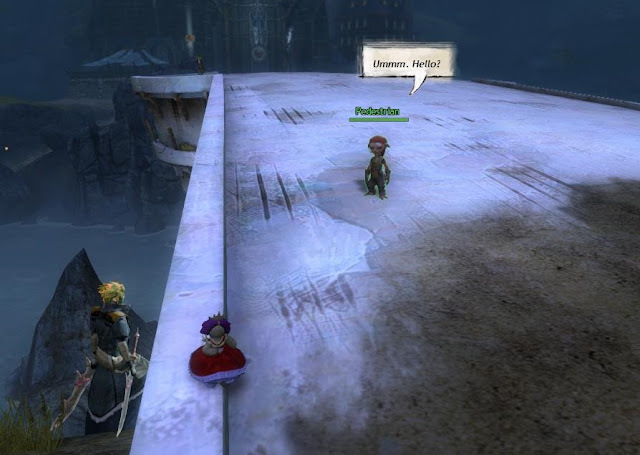 All over Lion's Arch you can find multi-racial groups of children at play. Human children and charr cubs seem to have a mutual attraction that rivals the bro-bonding of adult Charr and Norn. 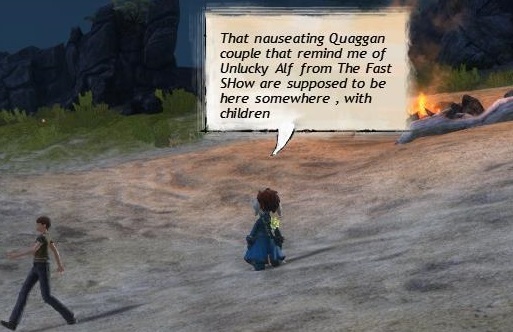 Or maybe those are Norn children. Whatever. When these kids grow up everything will change. 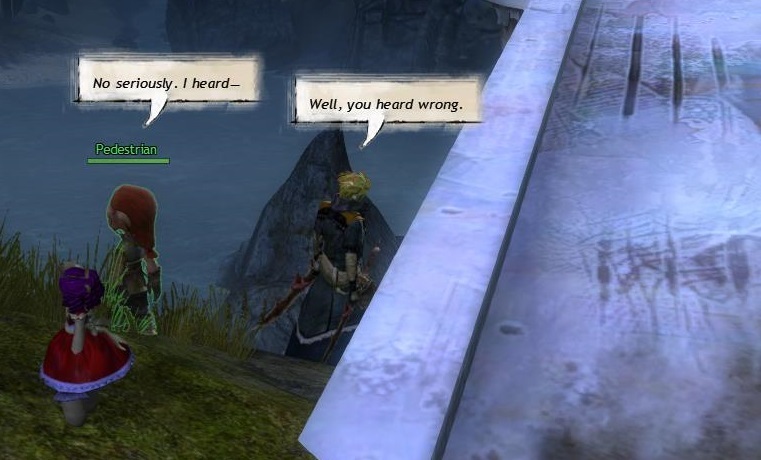 Already, though, Tyria in general, Lion's Arch in particular, looks to be in the vanguard of social change. Gender reassignment and sexual orientation (Hi, Jory! Hi, Kas! ), racial harmony and who knows what else. It's heartening for sure. But let's not paint too bright a picture. There's a worm in the apple. I ran into Inspector Lizzi on the beach. She'd found something. Something very bad. The twisted corpse of a sylvari on the sand. I stopped to see if I could help. What she told me brought a bitter chill to the bright day. Blood speaks to blood as the sap runs thin. There will be an accounting. Right now, Lion's Arch is at peace, or so it seems. Enjoy it while you can. It won't last. It never does. Remember, we all stand together or we fall. 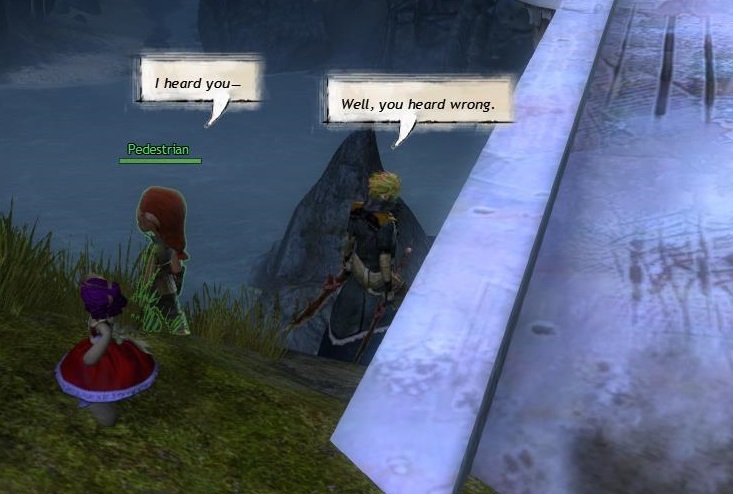 This week's update to GW2 has made me think more about what I want from that game in particular and MMORPGs in general than almost anything in a long while. Which is a surprise, because, in all honesty, I wasn't expecting very much. The whole thing was flagged up as a Big Deal of course, what with the pages and pages of patch notes and the press releases and so on, and we've been so starved of anything you might reasonably call new content for so long that you couldn't help but feel a frisson of anticipation. Even so, my personal hype meter wasn't registering off the scale anything like the way you'd think it might. Perhaps that's why I'm so impressed. And make no bones about it, that's what I am. Impressed. And pleased. Impressed and pleased. A happy customer. After all the foot-shooting over the pre-purchase announcement ANet needed a win and they got one. With me, anyway. 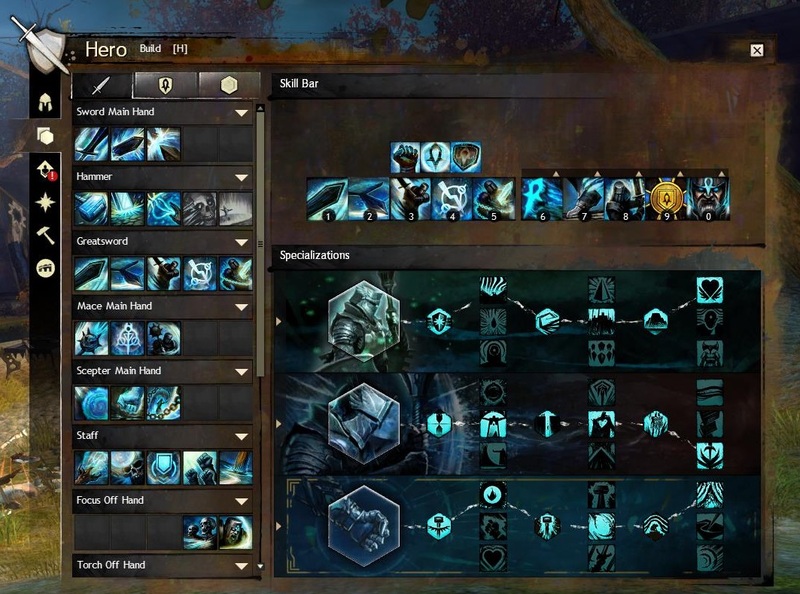 The two big pillars of the patch were the root and branch revamp to traits, skills and the way the entire combat system works and the reveal of the rebuilt Lion's Arch. Either of those would be difficult enough to pull off separately. 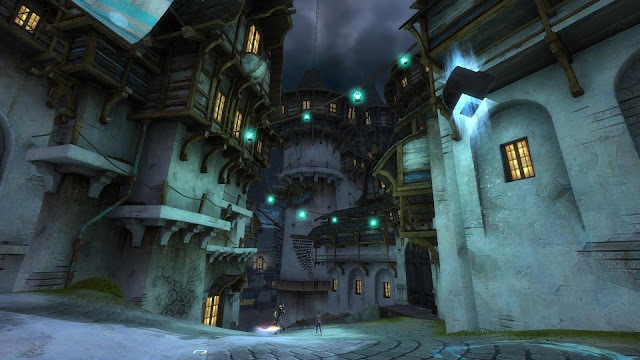 Plenty of MMOs have run off the road trying to negotiate tricky corners like changing the way people can play their characters or the look and feel of social hubs. Bundling them in together risked chaos and concern but I think they got away with it. I have a strong antipathy to visual overhauls of familiar places but I especially dread class balancing, combat rewrites and major overhauls of opt-in points systems like traits and skills. Theorycrafting "builds" is not a part of the hobby that particularly interests me. I'm fine with doing it once, the first time, as I level my characters up, but once I have a build that works I'm more than happy to use it, unchanged, for the next decade or so. I am very firmly in the "good enough is good enough" camp when it comes to that kind of busywork. Consequently I approach all of these Year Zero moments with a mixture of trepidation and annoyance. I would dearly love just to be able to log in and play and pretend these things weren't happening. And, miracle of miracles, this time that's exactly what I was able to do. Oh, there was one of those warning pop-ups telling me everything had changed but instead of leaving me with the usual bucket-full of returned points and slew of empty slots it directed me to a new build with everything all filled in and ready to go. All I had to do was give it the once-over to see if I approved my personal dresser's choices, which, for the most part, I did. I didn't even need to do that much, truth be told. I could have just closed the window and left it at that but curiosity got the better of me and I did mouseover a few things. It all looked fine so that was that. It helps that the new trait and skill windows are a massive visual improvement on the originals. There wasn't anything particularly wrong with the last version and if you'd asked me I'd have said it was fine. It was fine. This is better, though. It's sleeker, simpler, clearer and more intuitive. The flow is much easier to follow and changing from one build to another is simple and elegant. Apart from the slick new interface there's one great and as far as I can see entirely unheralded improvement; we now get a completely separate WvW build in the way we always had a discrete build for PvP. Unless I've misunderstood something, the traits and skills that you set when you're in any Mists map will lock and persist in all WvW maps until you change them again but when you drop back into a PvE map you'll autoswap to your pre-existing PvE build and vice versa. Hardly shouting the news from the rooftops, are they? I couldn't quite believe it when I noticed it, which I only did when I spotted the small text gloss as I looked at my build when I was standing around in Citadel. Surely this is the kind of major innovation everyone would be talking about? Apparently not. There it is, though, and it works. I tested it to be sure. The thing is, had I not spotted it, it wouldn't have mattered much. 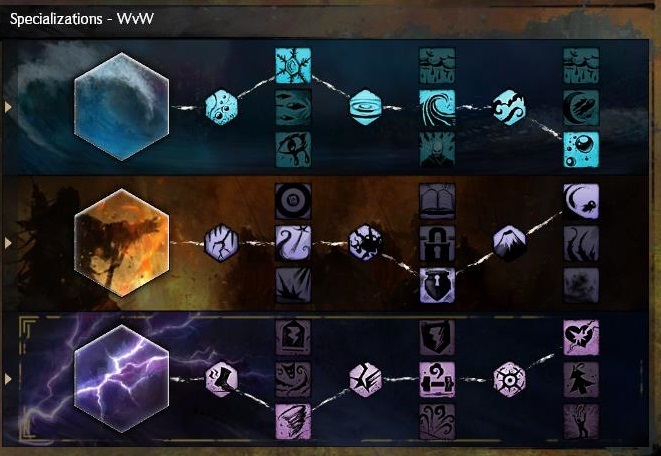 ArenaNet managed to transition my old builds into the new system with sufficient accuracy that I was able to play several characters without changing anything. That's a real achievement - 10AP to whoever came up with the idea and 50AP to whoever made it work. What's more, the new system is so user-friendly I feel confident and even inspired to play around with it to see if I can come up with something that suits me even better. 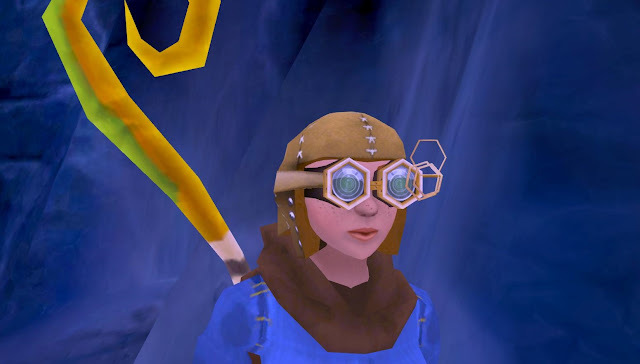 My necromancer is going to need some re-writes, for sure - someone seems to have mistaken her for a Minion Master. That cannot stand. Did they have to import all this sand? We won’t fix it all at once but these are four large topics we are talking about. They seem to be "talking" surprisingly fast because fixes are already coming in flurries but my main attention has been elsewhere. I was planning to write this morning about the changes to Lion's Arch and the way they have caused me to revise and revisit my whole outlook on MMO gaming but it's too big a topic to rush and I'm still mulling it over so this is the short version, which I can sum up like this: background is more important than foreground. 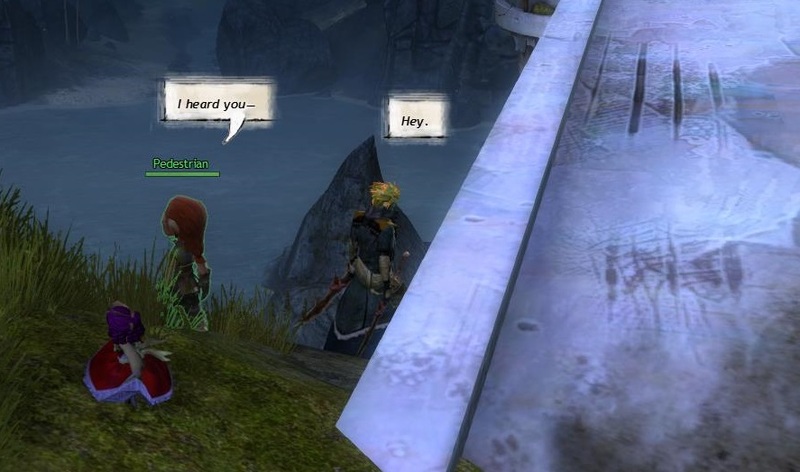 There's an argument to be had over whether MMORPGs need a "story" at all. Plenty of people feel they do. There are companies, BioWare being only the most obvious example, that have predicated their entire business model on that belief. On the other side are the people who believe just the opposite; that the only stories that matter in MMORPGs are those told by the players themselves. Again there are businesses set up to cater first and foremost to that audience . Who Is Data Dog? You may well ask. I'm not happy with either extreme. I feel story both has its place and should know its place. It's not the be-all and end-all but neither is it entirely dispensable. What I consider to be more important than either is milieu. My deep and abiding affection for Norrath, Telon and now Tyria doesn't derive from the great adventures I've had there or the friends I've made, immensely important though those are. It derives from the sense that I've lived there. For a place to feel that real other people have to live there too. 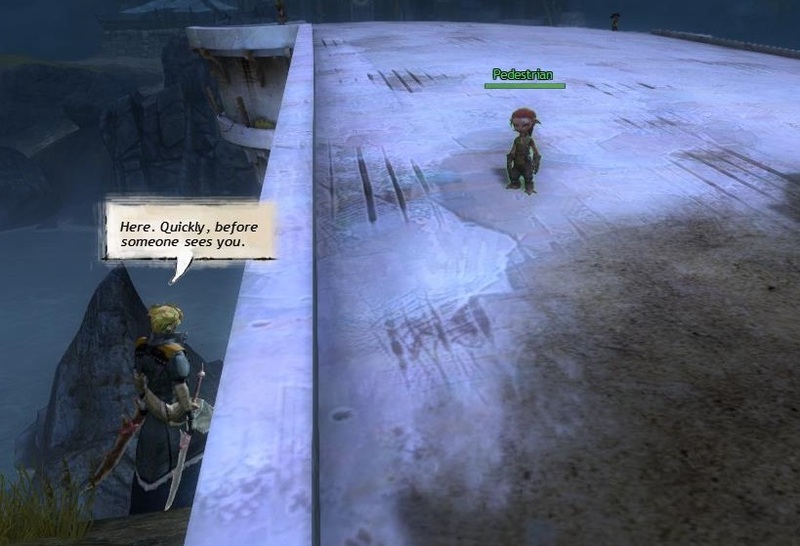 Players provide a lot of that life but the bedrock of belief comes from the real residents, the NPCs. There would be, wouldn't there? How did we ever manage before reddit? 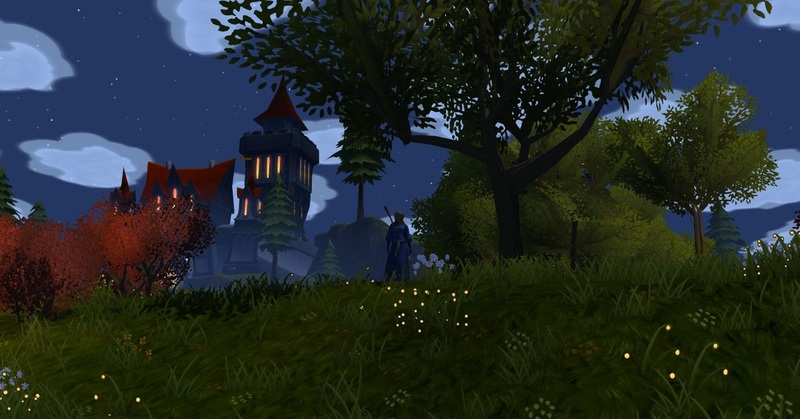 Right from when I first began playing Everquest I noticed that the world I'd stepped into was alive. Yes, some shopkeepers and guards might be at their posts twenty-four hours a day but a myriad of other characters were out and about, getting on with what appeared to be lives of their own. I spent hours in Freeport and Qeynos following NPCs about, trying to work out what they were up to and usually coming away little the wiser. 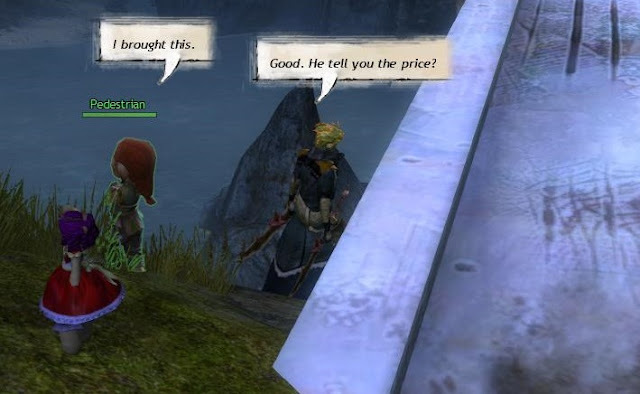 There seemed to be half a dozen or more NPCs who had business between Qeynos Hills and West Karana. I'd see them jog to the zone line and disappear. They're still at it now, most of them. I saw it on Ragefire only the other day and it still puzzles me. What are they up to and how can I find out? So am I! I was worried about you guys! When GW2 began one of the most striking and laudable elements of its rich mix was the wealth and depth of quotidian narrative. For a while it was one of the big talking points: not how we could beat the Elder Dragons but how much fun we were having throwing snowballs and picking apples. It wasn't so much the vaunted Dynamic Events, whose promised gleam so quickly tarnished, although they certainly added some new texture we hadn't seen before. It was much more the sheer detail of the everyday lives that carried on around them that drew us in and made us feel part of the world. You could have spent many hours in Metrica Province just trying to unravel the Asuran intrigues going on there, without ever lifting a sword or completing an event. I did. I do. You still can. You should. After a while, and really quite a short while at that, the perspective shifted to Orr and What Was Wrong With It and Was Zhaitan Really Dead and all that big picture stuff. All the little things faded into the background. When the first iteration of the Living Story arrived and we were asked to find lost toys in the snow and light fires to keep refugees from freezing there was something of a backlash. From then on Story had to come capitalized, in cut scenes and instances and Mysterious Letters, in sweeping sagas of adventure or family strife or social commentary, with Achievements and Rewards and Titles attached. And yet somehow a space was always found around the edge, out of the spotlight, for a score of smaller stories told in lower case. Every episode of the Living Story scattered a few seeds and there were some who cared more about what might spring up where they landed than they did about the latest installment of the Dragon of the Month club. They better not have brought their bad luck with them. It's been a long dry spell. I'd forgotten just how much those small stories meant. Since the patch landed I've spent almost all my gaming hours in the magnificent new Lion's Arch, exploring, watching and listening. From the Consortium's new HQ (just who is their mysterious, never-seen leader?) to the Dodgy House (as it's known Chez Bhagpuss) that only opens its doors at night to the spitting gourds that remind us all of lions lost there's a wonder around every corner. Snikk and Scratch captured my attention first. I tried to follow them but they use the waypoints. And why not? Who's to stop them? With so many adults killed in the battles with Scarlet and her armies Lion's Arch is awash with unruly children. They go where they please. The lucky ones, like Jordyn and Leyah, have found a measure of safety and security but the rest, who can say? I fear some Fagin is already at work and, Lyssa knows, the Lionguard aren't going to do anything to stop him. Trust me, Edward's slacking is the least of our worries. As I said, I'm still pondering all this. 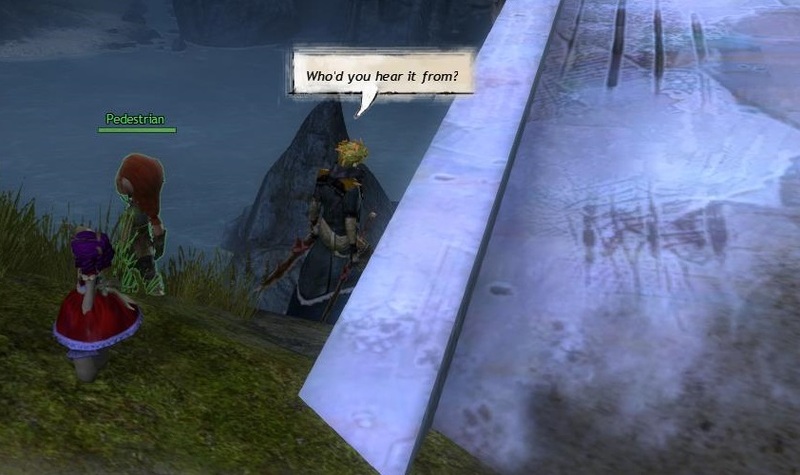 It's complex and fascinating and it will take a while to process but the return of Lion's Arch has reminded me of what was missing in my gaming world. It had slipped away almost unnoticed under a mass of dailies and achievements and loot runs. It's the wonder or being somewhere rich and strange, surrounded by mysteries you may never unravel; not the epic legends of dragons and gods but the small mysteries of everyday. I'd like a whole expansion's worth of this stuff please. Yes, the new Lion's Arch is very pretty and all. But there's something ugly lurking just below that shiny, new surface. We sent Agent Princess Doll to investigate. After all, who could doubt such innocence? And anyway, who ever pays attention to minis? She was wearing a wire of course. She kept her cool as the deal went down. Dropped a curtsey once in a while. Just to make things look good. And then The Boss had to come in, didn't he? Stomping all over Princess's fine work with his great, clawed size 19s. How he imagined he wouldn't be recognized... well, let's just say he's not the sharpest card in the Pact. Hard to imagine how Princess puts up with him really. Let's just hope he keeps his fat, furry face out of the investigation next time, when we go after the big boys. Ah, who am I kidding? He's never gonna learn.